Hard shorelines, characterized by concrete breakwaters or steel sheet piling, were commonly engineered along both the US and Canadian side of the Detroit River in the early 20th century to protect from flooding, and accommodate industry and ship navigation. Since the establishment of the remedial action plan, soft shoreline engineering, which is the process of using rocks, vegetation and other materials to improve the ecological features in the land-water interface, has been championed under the loss of fish and wildlife beneficial use impairment. Unlike a steel breakwall, which impedes the growth of plants, soft shorelines, also known as living or green shorelines, grow over time. 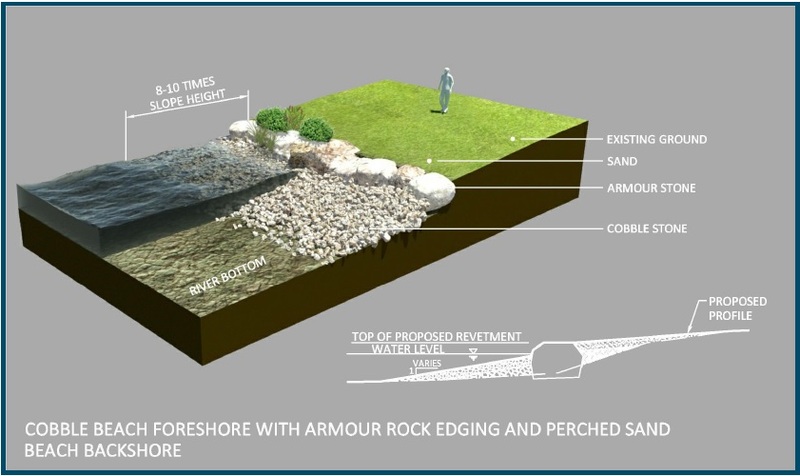 This technique provides wildlife habitat, as well as natural resilience to communities near the waterfront and can be an innovative and cost-effective technique for shoreline management. In 2011, the DRCC completed a shoreline assessment of Canadian mainland properties along the Detroit River to inventory and assess shoreline structures and conditions. More than 80% of the shoreline length has been developed as a result of urbanization, and that the shorelines fronting the large majority of the developed properties have been artificially hardened with concrete or steel. Since the late 90’s, eleven shoreline improvements have taken place along the Detroit River and one at River Canard Park. Please visit the habitat tab of our storymap for a description of these projects. 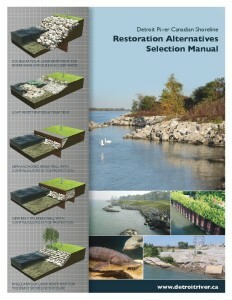 A public-friendly manual has been developed that describes the various options for shoreline restoration that are possible along the Canadian side of the Detroit River. Along with the manual is an easy-to-follow decision-making matrix to help guide landowners, contractors, and the technical staff of various approving agencies to choose the best shoreline solution for a given site, based on common site characteristics. The expectation is that this manual will be used to guide shoreline restoration efforts for private landowners working within the Detroit River AOC, and also to assist the DRCC partnership in determining the suitability of various sites for implementing fish habitat enhancement works.